Richard Buckminster Fuller said, "There is nothing in a caterpillar that tells you it's going to be a butterfly". I think this sums up why we like them so; they're proof that change is possible. This journal/mini-album is one I've been working on a few weeks now. It's taken me forever to finish. 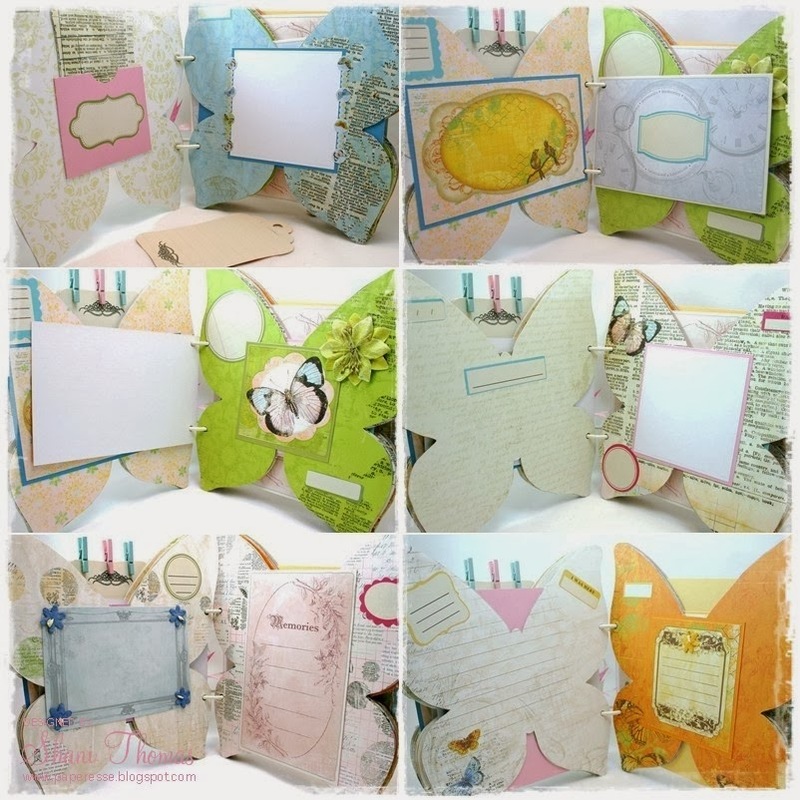 I started out by covering the blank pages of this Gaïa butterfly shaped album with paper. This in itself took me a few days. I used a book press with wax pages in between each page so they'd dry flat. I used mostly Bo Bunny's Country Garden paper, but there's a bit of Docrafts Born to Shop as well. I want this to be journal of personal discovery, of metamorphosis, so I've kept the pages fairly simple to allow room for writing, doodling or photos. I've made three large tags, stored on the back of the front cover in a pocket and near the back of the book there's another pocket. This clear, two pocket holder, houses colored index cards and quote cards. These quote cards have a quote on the front, but index card lines on the back for easy writing. I used vintage lined and blank paper on the tags and quote cards. 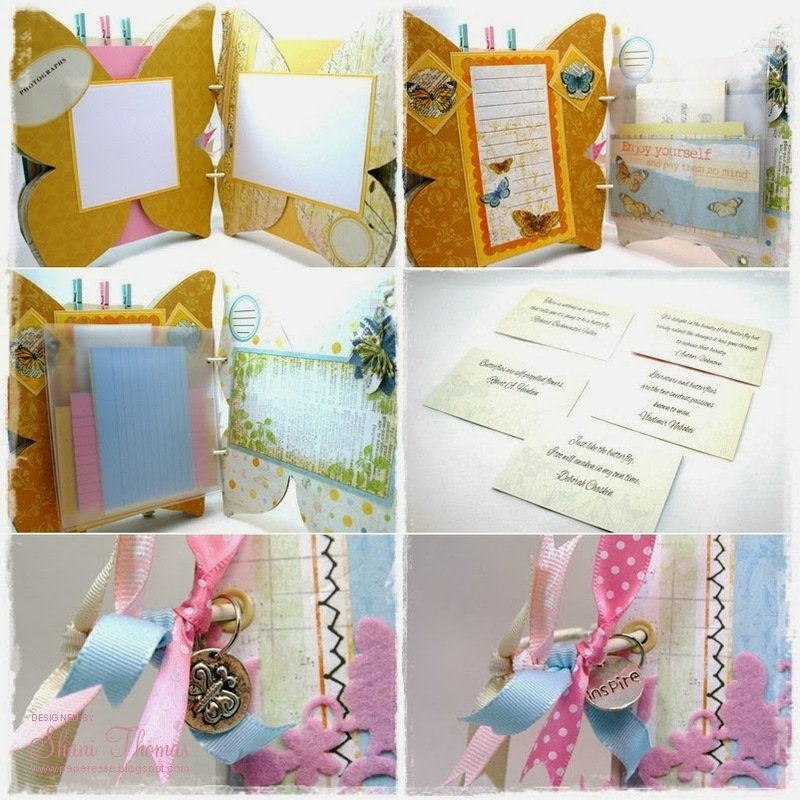 I also did a butterfly design on the quote cards, a bit hard to see in the photo. The back of the butterfly charm hanging on the front says "inspire". I've added an elastic band to keep it all shut. This is the journal/album before; as you can see, I changed its binding style. Oh Shani, this is beautiful! I can tell you put a lot of thought and love into this project. The pages are gorgeous.